@Dexios S Divine, someone once invited the Queen to their wedding as a joke, she showed up. 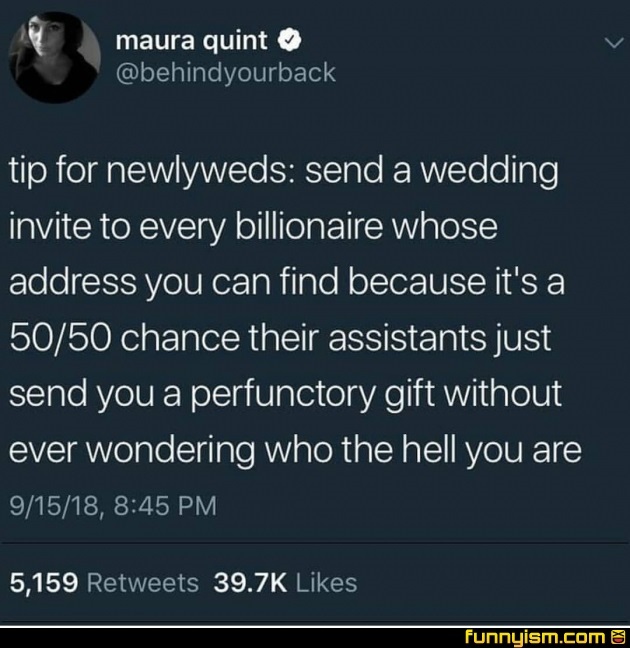 @I Am Captain Obvious, if you send the an RSVP, and they respond, there will be room for them. Yo btw has anybody watched Ajin demi human on netflix? @addibruh, yes, it is very good. I especially love the art style, a nice and different style than the norm. @addibruh, having an MC that is not a wimp, or someone that is always trying to do the good thing is really nice. @addibruh, it takes a while to get going, but it only gets better as it goes. Good character development and world building for an anime. @addibruh, didn't really get into it. Don't much care for the potato frame rate of the animation or the fuzzy, rigid drawing style. @mas2de, oh thank god im not the only one. I was looking through the comments hoping someone also sees it that way, haha. I just cant bring myself to like it. The visual style looks atrocious in my opinion, as it almost always does when ypu try and translate 3D to 2D. Also, the writing and story was bad to the point where I had to pause the show because I was laughing so hard. Ehhh you’d need the personal address for this to remotely work. And most billionaires are stingy. One time a few years ago a couple in England sent a wedding announcement to the Queen as a joke and she showed up.